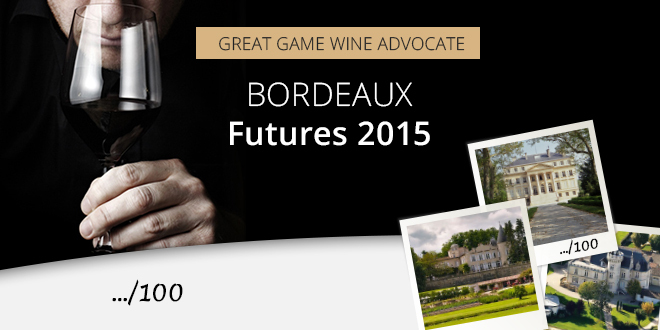 Wine Advocate’s Bordeaux Future 2015 Marks: will you be able to compete with famous tasters? Every spring, about 4,000 people gather at «Place of Bordeaux » for the opening of the wine futures week. More than 200 properties welcome journalists, buyers, retailers, importers, and other professionals of the wine from all over the world to taste the last year’s freshly extracted barrel samples. Prices are then announced by properties to the merchants who buy these wines – through the local brokers – and are work as the ambassadors of chateaux across the world, for all amateurs who want to acquire grand cru. This practice well-known in the wine world, but is perhaps less known to general public. Timing: from March 14th till April 15th (subject to the date of publication of the notes of Wine Advocate). Like every year, Wine Advocate will release their scores of the Grand Cru of Bordeaux in mid-April or even at the end of April, 2015. While patiently waiting for the results, Millesima offers to all amateurs of wine futures to guess the notes of six classified vineyards in the Médoc and Graves. With hints provided by the Wine Advocate critics in past years, and with a bit of luck and talent, participants will have the chance to win prestigious prizes, for eight winners. This game will introduce the new offerings of grand crus, while also providing a chance to win large sized grand crus (1 Double Magnum and 3 Magnums). Among more than 300 authorized merchants, Millesima has positioned itself as one of the oldest and largest buyers for nearly 30 years, with an annual average of 70,000 cases (or 840,000 bottles). Guaranteeing the best quality products coming directly from the chateaux and exclusively stocked in our 200 year old cellars, Millesima delivers to 120 countries, to around 88,000 clients, and acts as an ambassador for the region and for the biggest properties of Bordeaux. Delivery is guaranteed in the care of Millesima, delivered only a few weeks after their bottling. The biggest advantage to buy in future remains primarily the price. Millesima offers a very broad range of grand cru, accessible at exclusive prices, before the bottling happens in 2 years times. Moreover, grand crus are available in all possible formats: magnums, double magnums, jeroboams and imperials. Even if wine futures raises a controversy even today – tasting a wine six months after harvesting, isn’t it too premature to estimate the qualities of a wine? 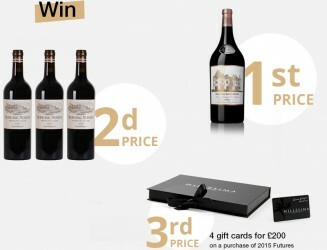 – Millesima, like all Bordeaux merchants, believes that buying futures gives numerous advantages which can’t be missed. Moreover, Millesima is also a supporter of «late Futures » by organising its famous Panorama Tasting of futures «1 year later» after it has spent time in barrels. Millesima enjoys an excellent level of confidence from its 88,000 clients. Millesima differentiates itself and distinguished itself as a key player, by providing reliability and values in offering wine futures. It also offers a large stock of deliver-ready wines in its cellar: 2,500,000 bottles. This pledge of seriousness is regularly recognized by specialized journalists and press. The game is available in three languages: French, English, and German. To participate in the game, visit us on our Facebook page. Previous: Wine Futures Alerts 2015 – Be the first to know!